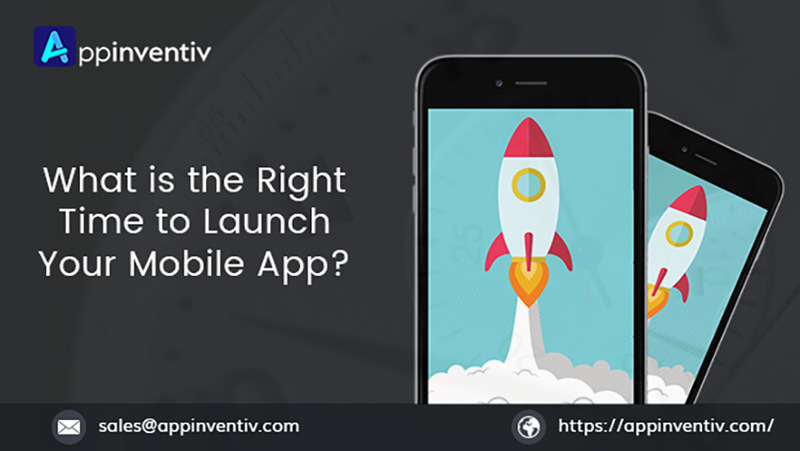 What is the right time to launch your mobile app? The ongoing progress of mobile technology, access to high-speed Internet and integration of cutting-edge technologies has resulted into an all-new and enticing atmosphere in the mobile world. Not only individuals are employing mobile apps day-to-night for their leisure, brands are also investing in mobile app development to entice their target users and do a profitable business. In such a scenario, it’s normal for a startup, an established brand or even for an individual to think of investing in market worth more than 88.3 billion US dollars. And it’s a great idea as well. However, when it comes to building a mobile application, one question that often arises in everyone’s mind is - When to launch an app? What is the right time to invest in app development? The market is flooding with apps and competition is rising exponentially; the timing matters a lot to ensure higher app success. Launching your app at the right time will fill your pockets with money. While on the flip side, your app might struggle if it enters the market at the wrong time - even when your app idea was superb, the development team was adept and marketing team was passionate. Here’s a guide with which you can figure out how to decide what’s the right time to enter the mobile market and get desired outcomes. To ensure that your app resides on the screens of every targeted user, the best practice is to understand their buying cycle. Every individual has a different cycle for downloading and installing newer apps. While some keep on trying newer mobile apps on a regular basis (1-2 every week), others install new applications at a high rate in the beginning of the month and stay away from the app store for the rest of the month. In fact, there are several people around who download new apps only when they buy a new phone. So, you need to put your best efforts into the market research and find out your target market’s buying practice, and then launch your application accordingly. Is your application related to some event or a seasonal sale? Or users can use your apps on a daily basis? Considering these questions also have an impact on your app revenue cycle. Let’s suppose, you developed a mobile application related to Olympics. If you launch your app when the Olympic games are over, your app might fail to entice them. Likewise, launching a Christmas-related mobile application in the mid of the year makes no sense. Thus, analyze your app services’ type and then define your app launch date. According to our mobile app developers, it is better to launch a seasonal app just before the season arrives. This creates a hype in the market and ensures higher downloads. Likewise, you should launch a tax-related mobile application in the starting months of the year, since people would be furious to pay their tax before April. It’s quite interesting that the time of the year, month, and week you launch your application also have a serious impact on the app success. According to Fetch - one of the reputed app marketing agencies globally, the best month to launch your application is December and February. This is the time when marketing buys cost goes high, which increases the chances of app success. While on the other side, August is the cheapest month of the year to enter the mobile market. However, the outcome is not satisfying since the app installs are slower in this period. Business apps: Higher downloads on Tues/Thursday; Higher revenue on Wednesday/Thursday. Educational apps: Higher traction on weekends. Health and Fitness apps: Higher downloads in the beginning of the week and on weekends (not Friday evening). Music apps: Although these apps are downloaded every day, the downloads graph reaches the highest point on Tuesdays and Saturdays. News-based apps: Everyday, except Tuesday. Social Networking apps: Higher downloads and revenue on Weekends. Entertainment apps: Higher downloads on Weekends; Higher revenue on Saturdays. Finance Apps: Higher downloads on Weekdays; Higher revenue on Sundays. Games: Higher traffic on Saturdays. Launching a mobile application also depends on the App Store you choose. For releasing an app in Google Play Store, the worst day would be Thursday, while it is Fridays for Apple App Store. As per our experience in the mobile industry, it is always better to launch your iOS app on Thursday and promote it on weekends. While deciding the date of your app launch, make sure that no reputed tech company is launching its apps or rolling out new innovations on the same date. Otherwise, your app might remain in the background; it will not get into the limelight. For instance, if Apple is going to announce something or release a new feature on your app’s launching date, planning to prepone or postpone your idea (preferably, by 8 a.m. London time) will let the users find your application first. And above all, make sure that you launch your mobile app only when it’s fully tested and approved. Mobile app development is a profitable yet expensive task. A single mistake could cost you a loss of millions. So, take every step wisely. Keep the above factors into your consideration while choosing the launching date of your application. Promote your app well, and also remain updated with the app store policies. Otherwise, you might fail to relish the expected benefits.